Now men and women alike are making unsightly facial and leg veins a thing of the past, thanks to the Cutera Laser Veins. No more painful injections! With the most advanced technology, a unique design, and a longer wavelength, the Cutera laser veins can safely and effectively treat both tiny superficial face veins and deeper blue leg veins in men and women of all skin tones. 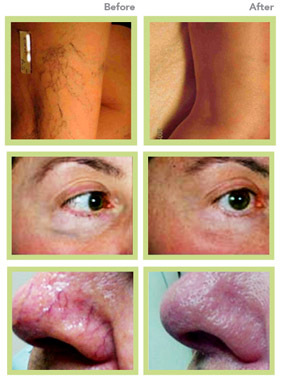 The Cutera Laser Veins difference. The Cutera Laser Veins combines the ideal laser wavelength with the most flexible parameters to deliver a superior vascular laser system. It treats a broad range of vessels from tiny spider veins to deep blue reticular veins quickly, safely and effectively. Patients with dark, light or tanned skin can experience outstanding results with minimal bruising or blistering. The Cutera laser vein system deliver pulses of light energy which cause the blood within the vein to coagulate, eventually destroying the vessel which is later reabsorbed by your body. Blood flow with then be redirected to veins deeper below your skin’s surface, where it should be. Although many patients report few if any side effects, those most commonly noticed are slight reddening and local swelling of the skin. These effects typically last for less than 24 hours. Some patients may experience bruising and in rare instances, blistering may occur. Consult with your medical professional for complete information on the benefits and risks of treatment. Most patients find that the majority of the treated veins have shown significant improvement within two to six weeks of treatment. However, your final results may not be apparent for several months. Over time, it is possible for new veins to appear, but these too can be removed with the Cutera Laser Vein. Spider veins are small veins often found on the surface of the skin. They can be found on the legs, face and body, and are usually easily identified by their thin red or blue “branches”. Unlike varicose veins, spider veins do not cause discomfort, pain, heaviness or aching, nor do they present any significant health or vascular concerns such as blood clots, leg swelling, or skin discoloration. Cutera laser therapy can also be very effective for treating discoloration in the skin caused by sclerotherapy. What areas of the skin surface can be treated for vein removal?